This month, the Alikay Naturals line debuted in Target stores. 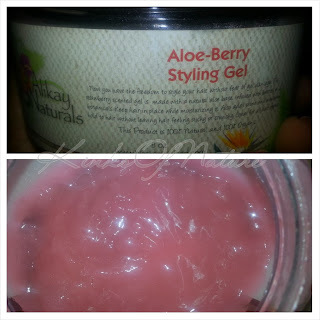 I recently finished the Aloe-Berry Gel. I'm not certain if it is included in the Target line, but here is another long overdue review. Product Claims: Now you have the freedom to style your hair, without fear of gel damage.This strawberry scented gel is made with a natural aloe base, infused with berries and botanicals. Keep hair in place while moisturizing it. Also adds shine and medium hold to hair without leaving hair feeling sticky or crunchy. Great for all hair types. This product is 100% natural and 100% organic. Key Ingredients*: Aloe Vera, Infused with Essential Oils and Berries, Botanical Blend, Coconut Oil, Almond Oil, Natural Fragrance. *A full ingredients list is not provided on the packaging nor the website. Thoughts: I had a better experience with Aloe-Berry than I did with the Creme Brulee (first impressions here). Aloe-Berry is a thin and light gel. The consistency is better suited for a pump bottle so it's disappointing that it's in a jar. Aloe-Berry provides a surprisingly strong hold. I get 7-day hair using this, and that's 7 days wearing it out. No puffs or buns, just a loose wash-and-go. It really gives me lasting definition. 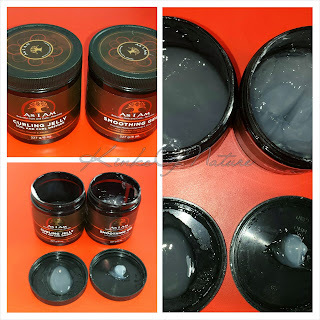 This gel dries quickly and with no sticky residue. My hair isn't dull either, like it is with the Creme Brulee. Aloe-Berry can feel a bit drying, but I've found that doing a deep condition and an oil rinse directly before application helps to keep my hair soft and moisturized. The fragrance reminds me of throat lozenges. It's very strong, but not as cloying as the Creme Brulee. Aloe-Berry Styling Gel (8oz for $10; 16oz for $18) is available through online retailers and local stores. To find one near you, visit the official Alikay Naturals' site. Would I repurchase? If they release a full ingredients list, I might consider getting the larger size during a sale. Until then, definitely not. I prefer to know what's in my products, and I was only able to get 3 uses out of one 8-ounces jar so it's not the most cost-effective product.